TV BROADCAST - ARMBETS.TV For those fans of our sport who will not be able to come to 17th International Tournament “ZLOTY TUR CUP” - Rumia 2017, we recommend to watch the live internet television broadcast of fights. Transmission cost: Zloty Tur 2017 (2 days) - $15; Vendetta All Stars Rumia Armfight #48 (2 days) - $15; Zloty Tur 2017 & Vendetta All Stars Rumia Armfight #48 (2 days) - $25. - I always said that armwrestling, and even more professional, requires investments. Organizing competitions, I spend my resource, not at all hoping that I will go to zero, - says Igor Mazurenko. - There is a mechanism that will allow us all to develop and make tournaments every time at a higher level. It is an opportunity to make a contribution in the development of armwrestling and its popularization on the world stage. 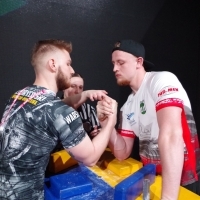 Active armwrestling fans - 20-30 thousand worldwide, and if everyone pays for the broadcast (although this has never happened before yet), then he will ensure the next Vendetta. And such a tournament can be arranged every month. Sponsorship brands give a little money. The organization of each Zloty Tour costs $ 75-120 thousand, And, for example, Nemiroff company at one time barely covered half of these costs. Therefore, I think that Pay-Per-View is the future of quality armwrestling, because this way spectators can show their interest, and in fact - pay salaries to favorite sportsman! Janis Amolins: "Zloty Tur interests me no less than Vendetta"
Dmitry Silaev: "I did not think that I would lose to Ongarbaev"